Carrier offers a wide selection of thermostats. Some come with wifi connectivity and some without. Some Carrier thermostat models can even control up to eight different zones. But wiring one of these is a job for a professional who will also have to wire together all the different elements of the systems, including dampers and zone controllers. A homeowner can wire a thermostat that controls a single zone, though, even if the system includes a heat pump. That makes the Carrier thermostat wiring a tad more complicated, but not unreasonably so. What Do Thermostat Wire Colors Mean? Standardized wire colors are just as important in HVAC wiring as they are in residential or telephone wiring. To make the point, thermostat and controller manufacturers label most of the wire terminals with the color of the wire you're supposed to use for that terminal. When doing Carrier thermostat wiring, you'll find a W (white), Y (yellow), G (green) and R (red) terminal. Actually, you'll find an Rh and Rc terminal, which supply power to the heating and cooling switch, respectively. They are often connected with a jumper wire, and a single red wire serves both of them. You'll also find a C terminal, which is an exception to the rule. It's the terminal for the common wire that provides a return path to the transformer so electricity can flow through the thermostat and power the display and programming features. The C-wire is usually black but sometimes blue. It isn't uncommon for wires to get mixed up, so if you already have wires sticking out of the wall, you shouldn't be too certain that they conform to the color code. It's best to check the control panel. Note which wire is connected to the W terminal, which one is connected to the Y terminal and so on, then connect each wire to the corresponding terminal on the thermostat. Thermostats have varying levels of sophistication and some, such as the Carrier Infinity thermostat, have remote sensing and programmable climate control functions. Wiring doesn't depend much on the thermostat features, though. It depends more on the particulars of the heating/cooling system. With a few exceptions, any thermostat that controls the system gets wired the same way as any other. Carrier thermostat wiring, Honeywell thermostat wiring – it's all basically the same. Red wire to Rh or Rc, which are usually bonded. The red wire controls the main power switch for the heater and the cooler. Black wire to C. This wire provides the return path for the power that flows through the red wire and through the internal circuitry of the thermostat. White wire to W. This wire switches the heater on and off. Yellow wire to Y. This controls the compressor that runs the cooling system. Green wire to G. This controls the fan. Orange wire to O. This controls the reversing valve that turns cooling pump into a heat pump. Blue wire to B. This also controls the reversing valve, switching back to the cooling function. Various colors for Y2, W2, X2, which are for second stage heating and cooling. Various colors for Y2, W2, X2, which are for second stage heating and cooling. Brown, pink, gray and tan are some possible choices. Besides these standard connections, you may have to make some that aren't standard. Some thermostats have a K terminal instead of Y and G terminals. It combines their functions, and you could use either a green or yellow wire for it. That's one example. If you're confused, check the manual. It has a wiring diagram, but to use it, you'll have to verify that the wires follow the standard color code. You can also examine the old thermostat before you disconnect it. If it was working properly, it's wired properly. Take a picture of the terminal connections for reference. Still need help? Call an HVAC pro. It may be an expense but probably not as much as you fear. 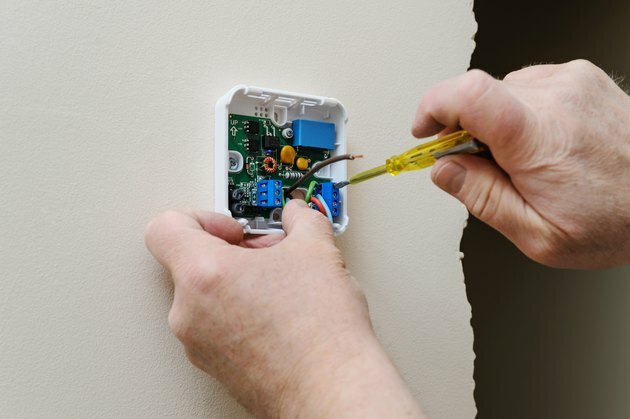 Wiring a thermostat usually doesn't take a pro more than an hour, so you shouldn't be charged for much more than a standard service call. What Is the Difference in Wiring RC and RH?